I know that’s the second or third panel you’ve used from whatever book that is…who did the art? Looks like Marie Severin, maybe? That is from “What the–? !” No. 2 (copyright Marvel Comics, Inc.), and the credits are Fred Hembeck “doing the story and scripting and such” and John Severin “with the pencils and inks that we love so much”. They look like George and Martha Wilson. Is that who they are supposed to be? 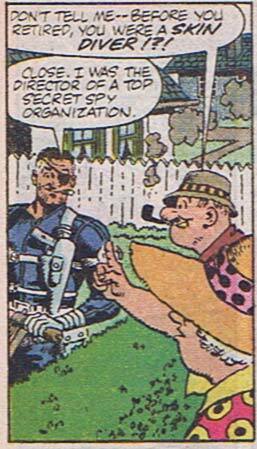 Wouldn’t that make Nick Fury Dennis the Menace? I think I like that! No, they’re just a retired couple in the community. The wife turns out to be a member of the HYDRA Women’s Auxiliary, which is the main part of the funny story. heh…I wouldn’t mind reading that story…!